If you thought Alabama was out of the running for No. 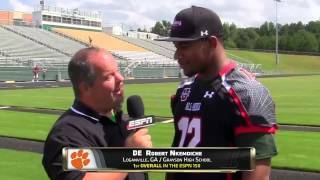 1 prospect Robert Nkemdiche, you'd be wrong. In fact, Bama is in the thick of the Nkemdiche recruiting process right now according to his mother. Although, she'd like to see her sons play together at Ole Miss, Beverly Nkemdiche is not against him going elsewhere. His brother says he'll be with him at Ole Miss-but what does Robert say? Right now, he hasn't said anything. To read more about what Beverly Nkemdiche had to say about her son's recruitment, check out this article from the AJC.